(KPAX) The bill to extend Medicaid expansion in Montana has passed a final vote in the state Senate. Senators voted 28-22 Tuesday to approve House Bill 658, sponsored by Republican Rep. Ed Buttrey of Great Falls. 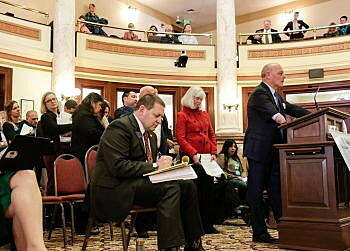 The bill would continue a program that provides government-funded medical coverage for about 96,000 lower-income adults in Montana. Medicaid expansion is set to expire in June unless the Legislature reauthorizes it. HB 658 would extend it several years and add new eligibility requirements. HB 658 had been stalled in the Senate for several days, until it was brought back and passed Monday on 26-24 votes. Two Republicans who voted against the bill then — Sen. Duane Ankney of Colstrip and Sen. Jeff Welborn of Dillon — supported it on Tuesday. Ankney had been holding out his vote in hopes of winning support from the Legislature and from Gov. Steve Bullock for Senate Bill 331, which would have encouraged NorthWestern Energy to buy a larger interest in the Colstrip 4 power plant. But he said Tuesday his goal had never been to kill Medicaid expansion. SB 331 was voted down in the House later on Tuesday. HB 658 will now go back to the House. If the House votes to approve the Senate’s amendments, the bill will go to Bullock for his signature. If they reject the amendments, a conference committee will have to reconcile the differences.